One of my Christmas presents from Mrs Best Beer HQ was this can of Garage Project’s Fuzz Box fuzzy pale. I didn’t have the heart to tell her that I’d already tried it a week earlier at one of the best Auckland craft beer bars, The Beer Spot. Blurb on the can: Forget clarity, there’s nothing clean cut about this beer. This is pale ale amplified and distorted in a giant wall of haze and hop feedback. Galaxy, Nelson and Mosaic riffs drift in a warm fuzz of juicy malt and tropical fruit nose. Plug it in, dial it up, kick the pedal, crack the can. It’s fuzzy ugly and you love it. Tastes like: Fuzzy peaches, and nectarines, orange, grapefruit, and mango. This beer may not be much to look at (it looks like some kind of cloudy beer milkshake, to be perfectly honest with you) but it’s sure got A LOT of flavour. Behind all that tropical fruitiness is mild malt backbone, which functions sort of like the bass player in a rock band, supporting the harmony and tying everything together. It doesn’t quite bring balance to Fuzz Box, because those Galaxy, Nelson and Mosaic hops are fiercely powerful, but it does bring some semblance of poise to proceedings. For me, the tropical fruit aroma does come through, but it doesn’t smell half as strong as it tastes. 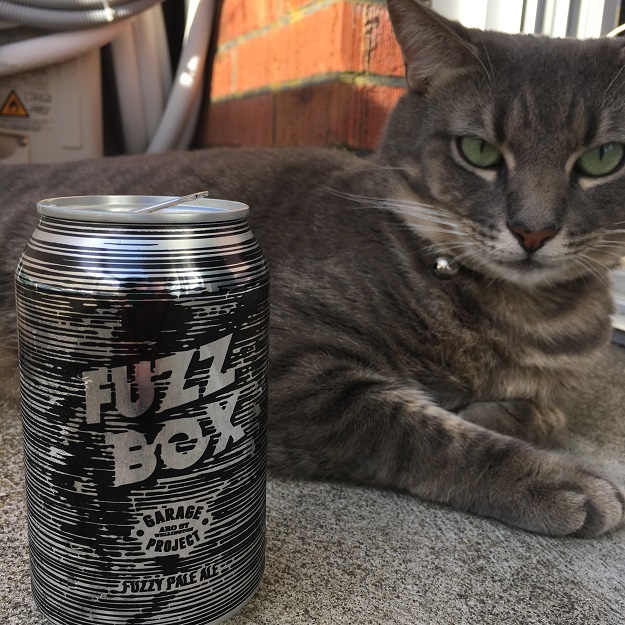 The verdict: It says on the can that Garage Project Fuzz Box was original brewed in collaboration with Sydney’s “rock god pizza tossers” Frankies. Well, I’m certainly glad that the Wellington craft brewery hasn’t reserved this beer only for them, because it’s a winner. Beer/movie combination: Hot Fuzz. Not only because they both share the word ‘fuzz’, but because I re-watched the Edgar Wright/Simon Pegg/Nick Frost action-comedy flick recently, and it’s still as great as the first time I saw it in the cinema.